I made these thick, soft, crumbly peanut butter and jelly cookies a few days ago and can’t get them off my mind. The recipe is from Quick-Shop-&-Prep 5 Ingredient Baking: Cookies, Cakes, Bars & More that are Easier than Ever to Make, from Jennifer McHenry of Bake of Break. I’ll tell you more about the cookies in a second, but first here’s a little more info on the book. It is not a cookbook with 5 ingredient recipes, but rather a collection of recipes that have up to five ingredients in addition to the basic kitchen staples of flour, butter, eggs, sugar, leavening agents and salt. It’s geared towards scratch bakers who want to streamline their pantry so they can make a wide variety of baked goods with only a few extra things from the store. For example, in this peanut butter cookie you have flour, baking powder, salt, butter, sugar, eggs and vanilla (pantry staples) leaving you with just two ingredients to buy — peanut butter and preserves. 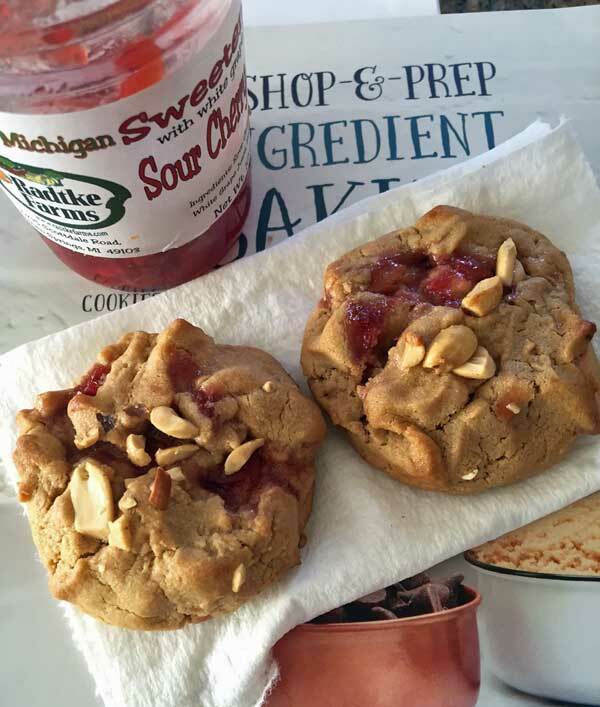 So Peanut Butter and Jelly Cookies would be in the “+2 Ingredients” chapter. Other recipes in the “+2 Ingredients” chapter include Toffee Pear Crostata where all you buy are toffee chips and pears, Lemon Ginger Scones, where you’ll need to buy a lemon and some buttermilk, and Cream Cheese-Filled Chocolate Chip Blondies, which appear to have a long ingredient list but in reality only require two additional ingredients — mini chocolate chips and cream cheese. In chapters that follow, you’ll get recipes where you add 3, then 4, then 5 new ingredients to your well-stocked pantry. The overall concept is interesting and I think both novice bakers will find it useful, but where it really shines is with the recipes themselves. They are streamlined with easy-to-follow-directions, include grams for accurate measures (hooray!) and cover a wide array of flavors and items. 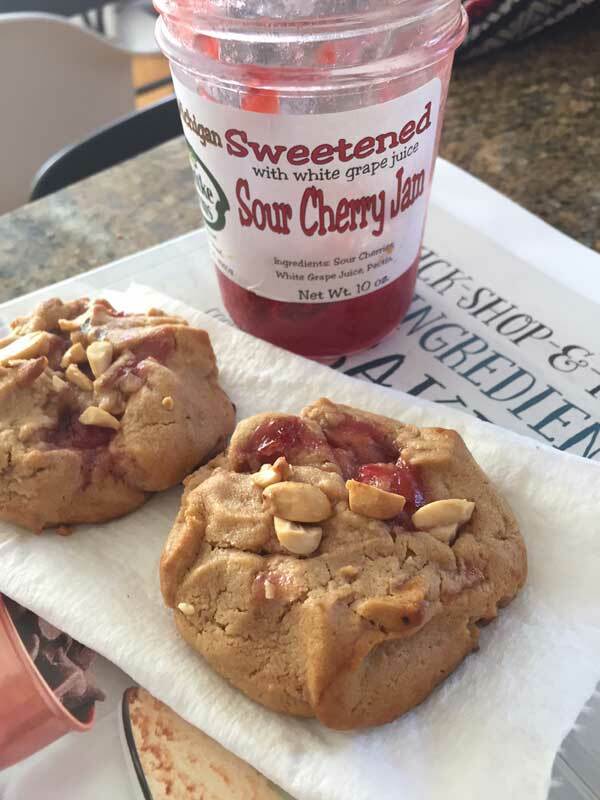 Even with all the cakes, pies and scones in the book, I naturally gravitated towards cookies, and Jennifer’s peanut butter and jelly cookies came through. The ratios she uses are interesting. The recipe calls for brown sugar (no granulated) and a pretty hefty amount of peanut butter to make a soft, not-too-sweet cookie that marries so well with the preserves. I tried the cookies with chocolate chips instead of preserves and they were good, but not as over-the-top good as they were with the preserves, which soften the cookies and change the texture. Not being a peanut butter and jelly fan, I was surprised at how much I loved these and can only imagine who happy they’ll make true peanut butter and jelly lovers. 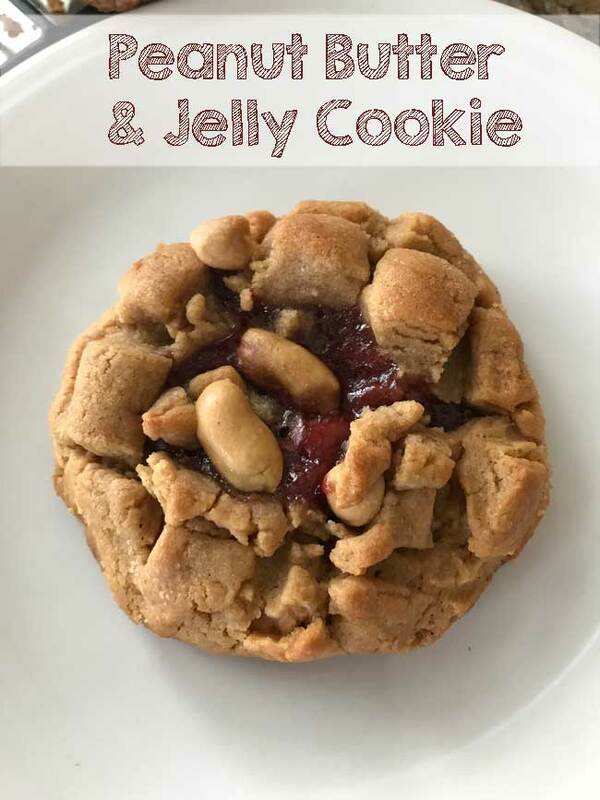 Peanut Butter and Jelly Cookies from 5 Ingredient Baking. Preheat oven to 350 degrees F. (180 degrees C). Line baking sheets with parchment paper or silicone liners. Using an electric mixer on medium speed, beat the butter, peanut butter and brown sugar until light and fluffy. Add the egg and vanilla and mix well. Using about 2 tablespoons (30 grams) of dough at a time, roll the dough into balls. Flatten each ball into a disk. Place about ½ teaspoon of preserves in the center of the disk. Fold the edges of the disk around the preserves. Roll into a ball. Place the cookies on the prepared baking sheets, leaving about 2 inches between cookies. Bake for 15 to 15 minutes or until the cookies arelightly browned. Allow to cool on the pans for 5 minutes. Transfer the cookies to a rack to cool completely. 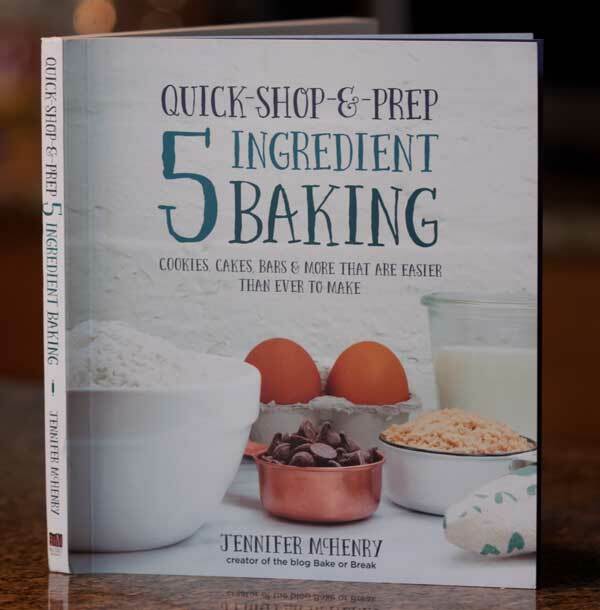 Recipe courtesy of Jennifer McHenry and Quick-Shop-&-Prep 5 Ingredient Baking: Cookies, Cakes, Bars & More that are Easier than Ever to Make from Page Street Publishing. Ohhh…these are going on the baking docket for this week! I already know that if I post anything about them there will be a line at my door. Looks like they’re topped with some chopped peanuts – lovely touch! Thanks for sharing this, my peanut butter loving friends will be in heaven! I somehow missed this when you first posted! Thanks so much for the review. I’m glad you liked the cookies and the book! I made these yesterday with blackberry jam, and they are wonderful! These sound great! It looks like there are peanut in them? How much did you add? Stirred into the dough or just pressed on top? Thanks for the great suggestions Anna! I was able to get almost all of them at my library. I have never seen a Mary Ann Esposito book and am excited to try her recipes. I already own Make Ahead cooking and took it out again today. It’s been a while since I cooked from it. I love anything by Cook’s Illustrated – the Family Cookbook/Baking Book are fabulous. Best pancake recipe ever!! I have a huge Junior League collection – I often have to tweak the older recipes to make them more flavorful. The same goes for my collection of church/fundraiser cookbooks. The blog cookbooks are always full of great recipes – of course yours is always a favorite! I also like Aarti Parti, The Pioneer Woman and so many others. I was looking at “Genius Recipes” too but it hasn’t made it to my Amazon wish list/cart yet either. Thanks Amy! I’m happy to hear you like the cookbook reviews and hope we keep agreeing on what we like and dislike in books. Since we agree on cookbooks, here are a few of my other current favorites. I try to post only about baking books, but I mostly read and use all-purpose/general cookbooks and love telling people about them ;). Dana Cowin of Food & Wine’s “Mastering My Mistakes in the Kitchen”. I read this book over and over and learn something new every time. Each recipe is from a chef who teaches Dana something new with the recipe. Definitely put it in your cart. Mary Ann Esposito books for Italian cooking. All of her books are good. An old one called The Peppers Cookbook by Jean Anderson. America’s Test Kitchen Make Ahead Cookbook. I keep checking this one out of the library and need to just buy it. Lots of good recipes and sreamlining tips. Modern Kosher Kitchen by Ronnie Fein — Ronnie is very creative, but keeps things simple. I love her style and her recipes. Robin Takes Five — I am obsessed with Robin Miller books. She only uses five ingredients, but she combines interesting flavors and with only 5 ingredients to deal with, I’m never overwhelmed by the shopping and prepping. Plus, whenever there’s a 5 ingredient recipe I invariable find myself adding a little of this and that and making the recipe my own (which we all tend to do). I want to buy the new “Genius Recipes” but am still on the fence. These look delicious and the book just somehow ended up in my Amazon cart! The cookbooks you review always end up being favorites!